Plants have their own defense mechanisms to protect themselves from animals and insects. Some ward off herbivores with their thorns, spines, and stinging trichomes, while some plants produce urushiol. Urushiol is in the poison ivy oil and poison oak oil that cause mild to severe allergic reactions in people. Urushiol allergy induces itchiness, swelling, and painful rashes and blisters to many who are sensitive to the oil. Urushiol is a powerful organic oil made up of many toxic compounds. It is present in the sap of the plant and it is usually a pale-yellow liquid with no odor. 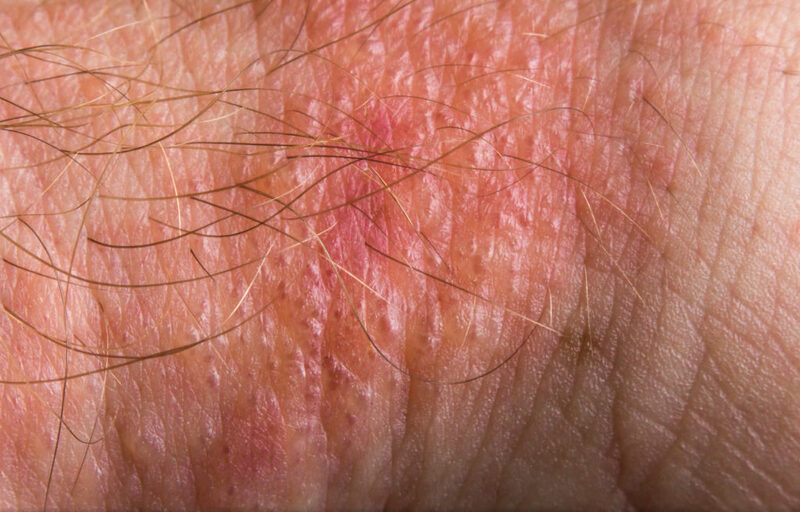 One nanogram (1 billionth of a gram) of urushiol can cause a skin rash in sensitive people. It is secreted from any damaged part of the plant or when it is touched. Burning the plant like poison ivy does not destroy urushiol oil but makes it even more dangerous as it can now be inhaled through the fumes. It is, however, soluble in ethanol, diethyl ether, and benzene. In Japan, they use the sap of the varnish tree (Toxicodendron vernicifluum) to create lacquer or urushi. 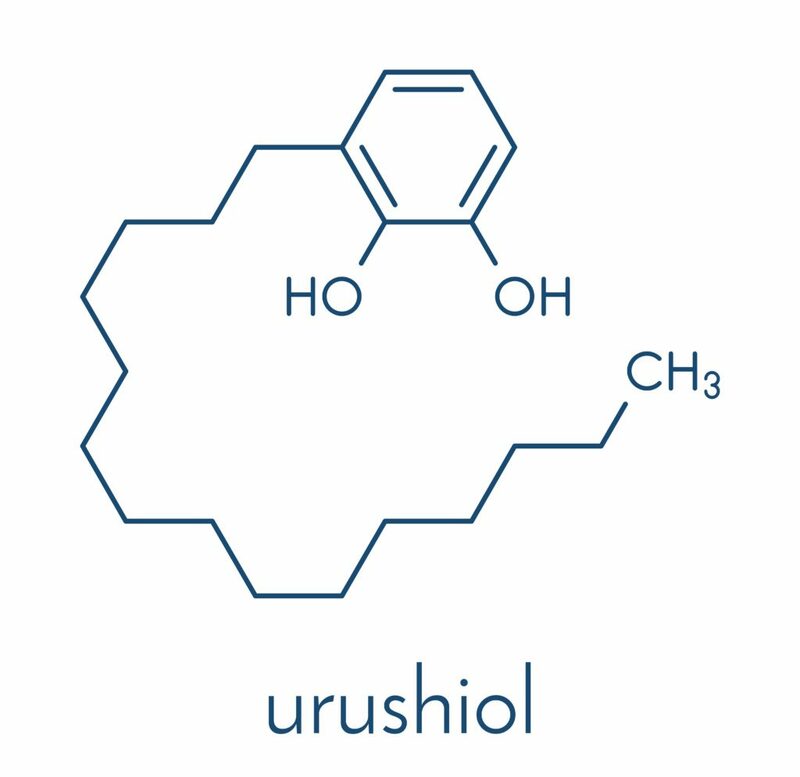 This is where the word urushiol is derived from. The Japanese lacquer tree is one of the urushiol-containing plants. And it belongs to the Anacardiaceae family, commonly known as the cashew family or sumac family. The most notorious of this plant family is the genus Toxicodendron, which literally means poison tree. All members of the genus produce the skin-irritating oil urushiol and well-known in North America are poison oak, poison ivy, and poison sumac. They usually have pinnately compound, alternate leaves and whitish or grayish drupes. However, there are other members of the Anacardiaceae family that are also urushiol plants. They include the mango, Rengas tree, Burmese lacquer tree, India marking nut tree, pistachio, and cashew. The urushiol is stored in the vascular system of these plants and is released when the plant is either touched or injured. The shells of cashews and pistachios have urushiol and they are either roasted or steamed to destroy urushiol. One unrelated plant to the Anacardiaceae family that contains urushiol is the Ginkgo biloba. The fruit’s skin has urushiol that can launch skin blisters. “How long is poison ivy oil active?” is only one of the questions people often ask about urushiol-bearing plants. Urushiol is extremely sticky and can stick to a surface and stay active for one to five years. This includes clothes, tools and the fallen or dead parts of the plant. Another fascinating fact about urushiol is that it does not seem to affect animals like birds, deer, goats, horses, and cattle that consume the berries of poison ivy, poison sumac, poison oak. Dogs and cats do not have allergic reactions when they brush or touch the poisonous plants. Also, not all people develop negative reactions like urushiol rash and blisters. Only 85 to 90 % of humans are affected by the oil and the 10 to 15 % are seemingly immune to it. Once a person has skin contact with poison sumac urushiol or any other urushiol-containing plant, it would usually take 12 to 48 hours to experience an allergic reaction. This is called delayed-type hypersensitivity. People vary greatly in their sensitivity to urushiol. Majority of adults produce a rash when they are exposed to 50 micrograms of purified urushiol, while very sensitive people only takes two micrograms or urushiol for an allergic reaction. Medically, the allergy is called urushiol-induced contact dermatitis. It is characterized by itching, redness, swelling, papules, vesicles, blisters, and, in severe cases, a burning sensation. It should be noted that the fluid contained in the blisters is devoid of urushiol. It takes about one to two weeks for the rash to run its course and may cause scars. Scratching may result in infection and this may require antibiotics. The allergic reaction on the skin is caused by the ability of urushiol to trick the body that it is under attack. This causes a violent immune system response. The T-cells of the blood release enzymes and toxins that damage nerves and result to itching and rashes. Without treatment, it would usually take two weeks for all the allergic reactions to heal. In severe cases, the rash can last for 30 days or longer. The primary urushiol treatment is to wash the exposed area immediately with soap, water, and friction to remove urushiol as much as possible from the skin surface. Commercial skin cleaners like Tecnu is used to as a body wash to remove poison oak, poison sumac or poison ivy urushiol. It should be applied two to eight hours before the rash begins but once the rash comes out, Tecnu can still be used to help remove any urushiol on the skin allowing the natural healing process to begin and avoid spreading it to other parts of the body. 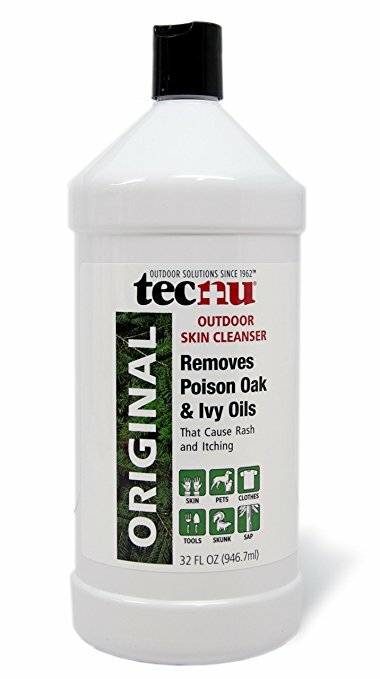 You can also use Tecnu to wash urushiol from clothes, tools, and pets. 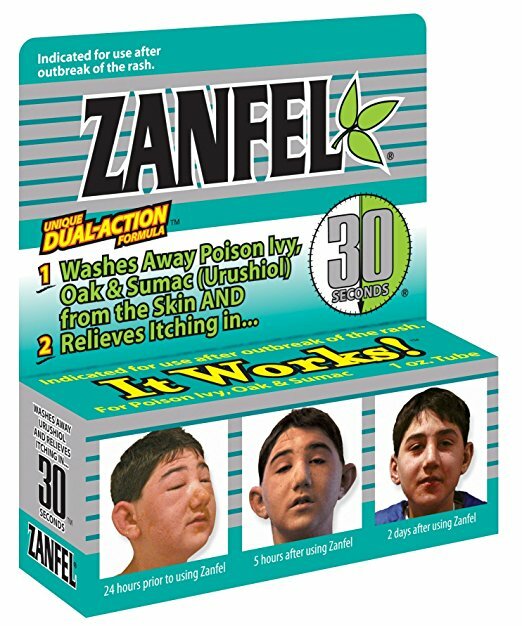 Zanfel Poison Ivy Wash is another product that can remove urushiol from the skin before or after the breakout and it provides immediate relief from itching and pain. Zanfel surrounds and removes the toxin from the dermal layers so that the body may immediately begin healing and will no longer attack itself. Over-the-counter topical corticosteroids and topical skin protectants, such as zinc acetate, zinc carbonate, zinc oxide, and calamine can be applied to ease the rash. And if infections occur, antibiotics may also be necessary. For severe symptoms, antihistamine and hydrocortisone creams, or oral antihistamines are prescribed, and for extreme cases such as systemic reactions, steroids such as Prednisone are administered. Use Oral Ivy for treating poison ivy symptoms. Put 10 drops of oral ivy in 2 ounces of water every 2 hours as needed. As symptoms improve, reduce it to once every 4 hours, then twice daily until symptoms disappear. Place drops under tongue in 2 ounces of water at least 15 minutes before or half hour after eating, brushing teeth or drinking anything except water. To prevent allergic reactions from urushiol, caution should be practiced whenever a person it outdoors. It is important to learn to identify poison ivy, poison oak, and poison sumac and avoid contact with them. And during a hike or camping, the skin should be covered as much as possible by wearing long pants, long-sleeves, shoes, and socks. The clothes, gears, and equipment used on the trip must be washed and cleaned right away as urushiol can stay active on them for years. Do not allow pets to run in wooded areas as they may be exposed to urushiol-bearing plants and bring it to your home through their fur. You may also oral ivy before the growing season. Take 3 to 5 drops of Oral Ivy in a small glass of water daily by mouth 7 to 14 days before exposure and continue throughout the poison ivy season. When poison ivy orpoison oak is growing in your yard or near your home, you should remove these plants. Attempting to physically remove poison ivy may expose you to urushiol and the plant may grow back as poison ivy, oak, and sumac have rhizomes and could just grow back. An effective poison ivy removal product is the Roundup Poison Ivy Plus Tough Brush Killer. It combines two brush-killing ingredients to penetrate the waxy leaves and brush of hard-to-kill weeds and poisonous plants to kill them down to the root. It would take up to four weeks or more to completely kill poison ivy plants with just one application of Roundup. Lastly, never burn toxic plants with urushiol as the oil can be released into the air through smoke. Inhaling the fumes can produce a fatal systemic reaction in any person who comes in contact with the smoke, even a mile or more away in certain conditions. Urushiol oil is a potent toxin no one should mess with as not everyone is lucky enough to be immune to it. The itch, rash, and blisters it can produce on the skin are truly a nuisance and even dangerous to some. It is essential that you are armed with knowledge and carefulness especially if you live in an area where poisonous plants are prominent. « Should You Pop Poison Ivy Blisters?